Customers from all over the country have been raving about what Star Hill Tools have done for them. "Thank you for designing and manufacturing the Jawz grabbing tool in such a wonderful and stout manner as I now have toppled and removed about 50 10 to 12 inch slash pines (root and tree). I simply use the scissor like jaws and cut the roots on one side and then lift and push the tree and it hinges right to the ground. It would not work well if I did not have the dual jaws as the tool really gets into the ground to get the roots( I go into the ground vertical with the tool and rip the roots apart). It works great with my John Deere 7410 tractor. I am preparing ground for new pasture and this was the best purchase and tool for the job and I will have no stumps to deal with. It is very efficient and highly recommend it. I plan to use it to clear and maintain fence lines as well as it makes quick work of removing palmettos, oaks, myrtles and brazilion pepper trees, and anything else that I attack. I have not found anything that it cannot handle, and yes I push it." "JAWZ has been a great addition to our equipment inventory. Now one man can safely do a job that used to take three. We no longer have to use the chain and bucket technique to handle large items. JAWZ allows one person to safely lift the load, never having to leave the operator's position. 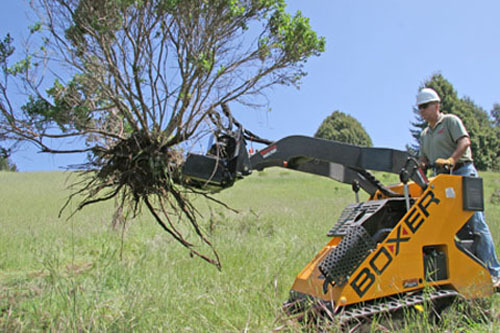 Whether it's pulling out trees, fence posts, or placing 500 lb boulders on a roadway median, JAWZ handled the job with no problem. We have placed over 200 tons of boulders in planting areas throughout the community. JAWZ allowed us to carefully place the rocks where they were needed rather than just rolling them out of the bucket and leaving them where they landed." 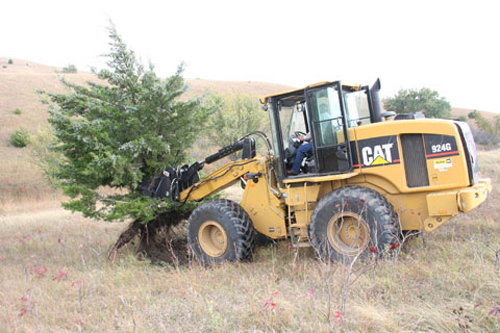 "Very appropriate to our use of pulling our cedar stumps and brush. Minimal impact to the environment." "Thanks for the call this evening about our Jawz tool. As I mentioned we have had good success using it on both honeysuckle and autumn olive so far.."
"After watching the video it was obvious JAWZ would be a handy tool for making firewood and also just the ticket for taking out scotch broom. Works fine." "The Jawz worked great! We removed hundreds of old grape vines and trellis poles. The Jawz turned a hazardous two person job into a very safe and easy one person job. That was the reason we bought it, but now we're finding many other uses for it as well." "I know men might think what I use the JAWZ for is silly, but I am sure there are some older men who can't move things and need an extra hand now and again. Since I work around the farm (I raise sheep), outside of my sheep dogs, the JAWZ is my best friend! 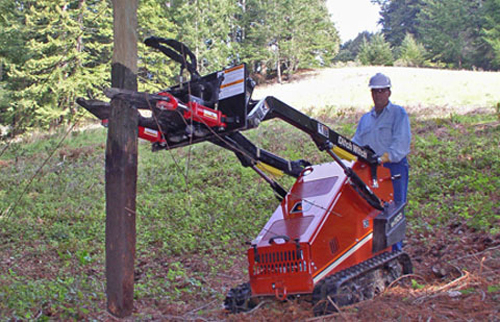 I use it to stretch fence lines with woven or welded wire. It is great. No more double come-alongs, top and bottom and such. It is so easy to remove the T-posts. I have been doing a lot of fence repair and running new fence. Being a woman and working alone, I am glad I purchased the JAWZ. It also does wonderful for the tree removal. I use it for a lot of odd jobs around the farm." "Since purchasing the JAWZ attachment, I continue to be amazed at its versatility and capabilities. 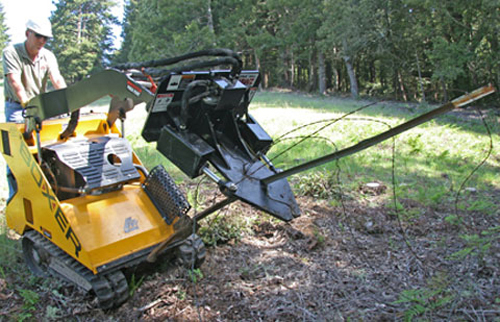 I have used it for everything from removing nuisance brush (buckthorn), moving large logs, removing small trees (up to 8'), pulling/installing posts, hauling heavy materials, and believe it or not, towing trailers! It has been one of the best investments I've ever made and I have been recommending it to many of my friends that are in the landscaping and construction trades. Thank you again!" "I just used JAWZ this past Saturday to pull out a neighbor's cemented in chain link fence posts, twelve posts in all. I returned to my property and picked up 7' or 8' piece of cement curb and deposited the curb into a dumpster (our house is under remodeling) I then proceeded to remove and stack 50' of 34 year old wooden retaining wall with 2 x 8 boards, 4 x 4 posts and all. I bought JAWZ to pull saplings and weed trees (Elms) and it pulls, and pulls, and pulls. Couldn't be happier. I just grab what I'm pulling about 3' to 4' up from the ground, drive forward a foot or two and backward a foot or two then vertically lift the object right out of the ground."